The Honda Civic Hybrid is a variation of the Honda Civic with a hybrid electric powertrain. Honda introduced the Civic Hybrid in Japan in December 2001 and discontinued it in 2015. In the United States, it was the first hybrid automobile to be certified as an Advanced Technology Partial Zero-Emissions Vehicle (AT-PZEV) from the California Air Resources Board (CARB). The Civic Hybrid uses an Integrated Motor Assist hybrid system similar to that of the Honda Insight. The Civic Hybrid was only marketed in sedan configurations. The Civic hybrid, based on the seventh generation Civic, was first introduced to the Japanese market in December 2001. Honda claimed it was the most fuel efficient 5-passenger gasoline-powered production vehicle in the world at the time. It was introduced to the U.S. in spring 2002 as a 2003 model. It is the first hybrid vehicle to be certified as an Advanced Technology Partial Zero- Emissions Vehicle (AT-PZEV) from CARB. The first generation of the Honda Civic Hybrid was based on the seventh generation Honda Civic. It was the first mainstream vehicle from Honda equipped with a gasoline-electric hybrid system and became the second hybrid model of the company after Insight. Model with manual transmission was rated city 46 mpg‑US (5.1 L/100 km; 55 mpg‑imp) / highway 51 mpg‑US (4.6 L/100 km; 61 mpg‑imp) according to United States Environmental Protection Agency (EPA) fuel mileage estimates, about the same combined mileage as for the Toyota Prius, and became the most fuel-efficient five-passenger sedan ever sold in North America at the time. Twin spark plugs light the lean fuel-air mixtures sent to the two-valve combustion chambers. 1.3-litre single overhead cam i-DSI lean-burn internal-combustion engine with VTEC Cylinder Cut-off System, which allows three cylinders to deactivate during deceleration. The engine generates 85 hp (63 kW) at 5,700 rpm and 87 lb⋅ft (118 N⋅m) of torque at 3300 rpm. Idle stop - when stopped at traffic light, the engine shuts off automatically, then restarts immediately when the driver takes their foot off the brake, contributing to both greater fuel efficiency and lower emissions. 10 kW (13 hp) brushless, permanent magnet assist motor, which functions as a generator during deceleration recharging the battery (regenerative braking). Combined output of both engine and electric motor is 93 hp (69 kW) at 5,700 rpm. Maximum torque is rated 116 lb⋅ft (157 N⋅m) at 1,500 rpm for manual transmission models and 105 lb⋅ft (142 N⋅m) at 3,000 rpm for CVT models. 144 V Nickel-metal hydride batteries with 6.0 A·h capacity. Honda Multimatic S continuously variable transmission or 5-speed manual transmission. ULEV or AT-PZEV certification by the California Air Resources Board (CARB). Low rolling resistance tires (P185/70R14) on aluminum wheels and regenerative braking. An electric motor is sandwiched between the gasoline engine and the transmission, providing up to 13 horsepower. The motor also acts as a generator, to recharge the car's nickel-metal hydride battery located between the rear seat and the trunk, and as a starter motor. The motor in Civic hybrid is about a quarter-inch (6.4 mm) thicker than that of the Insight. Through improvements to the magnetic coils of the DC brushless motor, it achieves 30 percent greater assisting and regenerative torque than the previous model without increasing the size. It generates more torque (46 versus 36 pound-feet) than the motor in Insight. The electricity is stored in a battery consisting of 120 1.2-volt Ni-MH D-cells wired in series. The battery can charge and discharge more rapidly and efficiently though the total capacity is reduced from the Insight's (6.0 versus 6.5 AH). Efficiency of the battery modules is increased, through a reduction in energy losses. The battery is housed with the electrical controller in a package called the Intelligent Power Unit (IPU). The new packaging reduces the size of the system by 50 percent and allows the IMA equipment be placed behind the rear seat in the trunk. The unit weighs only 63 lb (29 kg) and is one-third smaller than that of the Insight. The two spark plugs in each cylinder can fire either sequentially or simultaneously, enabling more efficient burning during lean-burn mode and more often lean-burn operation. The engine can operate at a lean 22:1 air-to-fuel ratio more than 60 percent of the time on a flat road. The VTEC cylinder idling system of the engine closes the valves in three of the four cylinders when the car is decelerating, reduces the power lost to the engine by 50 percent, and allows the IMA to extract more electrical energy during braking. The rocker arms operating the intake and exhaust valves have two modes: valve-lift mode or idle mode. They are engaged via a synchronizing piston. During deceleration, the synchro piston disengages the lift-mode rocker arm so that the valves remain at rest, effectively sealing off the cylinder. An idle stop feature shuts off the engine automatically when stopped, then restarts immediately when the driver removes their foot from the brake. This auto idle stop system contributes to both greater fuel efficiency and lower emissions. During stop and go driving, the engine will turn off when the car comes to a stop for the first time, however, if the car does not go above 10 mph (16 km/h) and stops again, the engine will not turn off unless the car is stopped for more than 15 seconds. With assistance from the electric motor, the combined torque at below 3,700 rpm is greater than that available from the non-hybrid Civic's 1.7-liter engine. Fuel efficiency is further improved by six percent by utilizing: a new front air dam and rear spoiler, along with revised underbody panels, reducing the drag coefficient from 0.30 to 0.28; replacing traditional power steering with electrical power result as reduction in parasitic losses and special lower rolling resistance tires. The Dunlop tires improve ride quality and reduce road noise compared with other hybrids like Insight and Prius. When compared with Insight, a wider tire improves stability at highway speed. Car and Driver reported that the car can accelerate 0–60 mph (0–97 km/h) in 10.9 seconds. The Civic hybrid is estimated to be 40 percent more fuel efficient than its non-hybrid counterpart. The Civic Hybrid's engine won the International Engine of the Year "1 litre to 1.4 litre" size category award for three years straight from 2002 through 2004 as well as the "Best Fuel Economy" category for 2003 and 2004. The second generation Civic Hybrid is based on the eighth generation Civic. As with other Civics, there are some styling differences to the exterior between the North American and the Japanese market models. The powertrain of the second generation Civic hybrid is similar to that of the first generation. 158.4 V (132 x 1.2 V) Nickel-metal hydride batteries with 5.5 A·h capacity that is 12% smaller. Updated to three stage i-VTEC and VCM (Variable Cylinder Management), which permits deactivation of all four cylinders when cruising at moderate speed to run on electric power only. Engine output is increased to 93 hp (69 kW) at 6,000 rpm and maximum torque to 89 lb⋅ft (121 N⋅m) at 4,500 rpm. Combined output of both engine and motor is 110 hp (82 kW) at 6,000 rpm. Maximum torque is rated 123 lb⋅ft (167 N⋅m) at 2,500 rpm. A new hybrid compressor for the air-conditioner. The continuously variable transmission provides a 9% wider range between the maximum and minimum gear ratios for better acceleration and reduced engine rpm at high speeds. The U.S. EPA fuel economy estimate is increased to city 49 mpg‑US (4.8 L/100 km), highway 51 mpg‑US (4.6 L/100 km). (In 2008: EPA revised the way it estimates fuel mileage, as a result, the EPA rating for the 2008 model is: city 40 mpg‑US (5.9 L/100 km), highway 45 mpg‑US (5.2 L/100 km)). Updated to 15-inch lightweight aerodynamic alloy wheels (later featured on the Civic DX-G in Canada as well). Certified as AT-PZEV throughout 50 states. By using high-performance magnets and high-density windings, Honda is able to increase the power output of the electric motor by 50% to 20 hp (15 kW) at 2,000 rpm when compared with the first generation. The inverter that controls motor speed is integrated with the motor's ECU for more precise control, resulting in greater efficiency and fuel economy. The output of battery is increased by around 30 percent to 158.4 V. The battery storage box is designed for better cooling performance and vibration resistance to enhance long-term reliability. The higher output of electric motor enables the car to run on electricity only, at a steady 15 to 20 mph (24–32 km/h) when cruising on a flat surface. An internal electric motor is added to the air-conditioner, so it can be powered by either the engine, an electric motor, or both. At a stop, the compressor powered by the battery keeps the cabin cool. An additional compressor that is powered by the petrol engine also engages if rapid cooling is required. When the interior temperature is stable, air conditioning is provided by the battery solely. As soon as the brake pedal is lifted, the petrol engine comes back to life again. The new three stage i-VTEC valvetrain has low-rpm, high-rpm and cylinder idle mode. High output valve timing helps the engine to increase its output by 9 percent. During deceleration, the engine is kept idle. There is no combustion in all four cylinders and the cylinders are sealed shut, reducing pumping losses by engine. As a result, recovery of energy wasted during braking is improved by 10 percent. A digital display is incorporated in the instrument dash showing how much electricity is sent to the battery or how much is used. When the car is braked moderately, maximum number of green LEDs light up showing energy recaptured. When the car is braked harder, the conventional brakes are activated. Car and Driver found the car, when compared with previous generation, faster, offered greater refinement, quieter at highway speed, has a stiffer body and a revised suspension that handles bumps better and quietly. It is estimated that, when compared to a gasoline engine only Civic sedan of 2006 with an automatic transmission, the Civic hybrid provides an increase of fuel economy in city driving of about 63 percent and an increase of fuel economy in highway driving of about 27 percent. The CVT transmission is designed to achieve the highest efficiency for a given RPM. A class-action lawsuit filed in 2012 alleged that Honda falsely advertised the fuel economy of the Civic Hybrid and that owners were getting significantly lower mileage. The Los Angeles Times reported in May 2012 that at least 36 small-claims lawsuits had also been filed against Honda over alleged false advertisement of gas mileage. Some users reported that the fuel economy of the Civic Hybrid was reduced after Honda installed a software update to prolong the life of the hybrid battery by reducing the electric motor's output and putting more reliance on the gasoline engine. A Consumer Reports survey found a very high rate of battery failure in Civic Hybrids 2nd-generation Civic Hybrids, describing the failure rate for 2009-2010 models as "shocking", with over 30% of responders reporting they had needed a battery replacement within the last 12 months. Honda acknowledged problems with the 2006-2008 models which could cause the batteries to "deteriorate and eventually fail"; software updates were issued to prolong the life of the battery, but some owners reported these updates led to reduced fuel economy and power. The 132 NiMH cell pack suffers from imbalance as individual cells can't be monitored or charged. Monitoring is available at a 12 cell sub-pack level, but charging isn't. After years/miles of use, the cells become imbalanced as the cells charge/discharge at slightly different rates from one another. Eventually, strong cells are limiting the upper capacity of the pack and weak cells are limiting the lower capacity of the pack thereby reducing the usable capacity of the pack. There are higher capacity non-OEM packs available for less than the OEM price, and many owners have achieved years-long extensions of usable battery life by utilizing a grid charger. A grid charger is a home-made or purchased charger that connects your car to the power-grid. These devices impart a long, slow "balancing" charge where all cells are gently charged to their maximum capacity. This can temporarily restore balance and dramatically improve usable capacity for months at a time. In March 2015, Honda sent 2009-2011 owners a letter indicating that all versions, not just the PHEV states, would get the 10 year/150,000 mi warranty on the IMA battery. Reference Service Bulletin #15-006. The Civic hybrid ranks as the second best selling electric hybrid car in the U.S.
Consumer Reports ran an article in April 2006 stating that hybrid vehicles would not pay for themselves over 5 years of ownership. However, there was an error in the calculation of depreciation for the hybrid vehicles. It resulted in overstating how much extra money the hybrids would cost their owners during the first five years of ownership. When corrected, the Honda Civic Hybrid did have a payback period of slightly less than 5 years. In October 2010 Vincentric performed a hybrid cost of ownership analysis for the USA market. In this analysis it compared hybrids' 5-year cost of ownership to their all-gas counterparts. The analysis showed that the 2010 Honda Civic Hybrid cost an additional $1830 over a 2010 Honda Civic EX 2D Coupe with an Automatic Transmission (the report assume 15,000 miles are driven annually and fuel prices are based on a weighted average over the five months prior to October 2010). In August 2010, Autoblog reported that a replacement battery for the Civic Hybrid retailed at $2,100. The Civic hybrid was introduced to Malaysia in August 2007. It was launched in China in November 2007 and in India in June 2008. 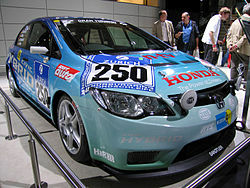 The Honda Civic Hybrid competed in 24 Hours Nürburgring in 2007, finishing 108th out of 220 teams starting. The twenty-four hour race is held around the Nürburgring, one of the world's most grueling courses. A Group N spec Honda Civic hybrid raced in the Jim Clark Rally and took second in class. 2006 Motor Trend Car of the Year award, along with the rest of the Civic range. 2006 Automotive Journalists Association of Canada (AJAC) Award for Alternative Power Vehicle. The last Civic Hybrid was launched during 2011 in the U.S. and Canada as a 2012 model. It has a larger 1.5-liter i-VTEC engine that produces 90 horsepower and 97 pound-feet of torque and a lithium-ion battery pack instead of nickel-metal hydride. The larger engine replaces the 1.3-L engine for better mid-range torque. The DC brushless permanent magnet motor, which is placed between the engine and continuously variable transmission, provides 17 kW (23 hp) and 78 pound-feet of torque and weighs 0.7 kg (1.5 lb) less. The 2012 Civic Hybrid has an EPA rating of 44 mpg‑US (5.3 L/100 km; 53 mpg‑imp) for the city and highway driving cycles, an improvement from 40 mpg‑US (5.9 L/100 km; 48 mpg‑imp) city and 43 mpg‑US (5.5 L/100 km; 52 mpg‑imp) highway for the previous generation. The Civic Hybrid has the latest Integrated Motor Assist (IMA) parallel hybrid system, with a new 20 kW lithium-ion battery — a first for a Honda hybrid vehicle. The new battery is 5 kW more powerful, 9 kg (20 lb) lighter and takes up 36% less space. Battery capacity is increased from 35 kAh to 100 kAh (4.5 Ah). It comes with improved aerodynamics and Honda ECO Assist technology. The ECO Assist technology is an information system to help the driver adopt a more fuel-efficient driving style, and is proven to improve fuel economy by about 10% for Honda's hybrid vehicles in Japan. Production of the Civic hybrid sedan was moved from Suzuka, Japan to Indiana, United States in early 2013, following the production of the Acura ILX hybrid commenced at Indiana plant in April 2012, after production capacity was expanded to 250,000. In February 2009, Honda reported that since 2001 they had sold more than 255,000 Civic Hybrids, including more than 190,000 units sold in North America. For a time, the Civic Hybrid was the second-best-selling hybrid electric car in the U.S. 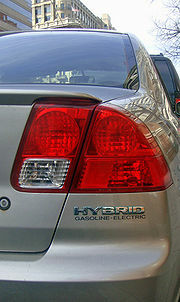 It is reported that over 50,000 Civic Hybrids were sold during 2007 worldwide. In January 2012, Heather Peters was awarded $9,867 by a Los Angeles Superior Court small-claims commissioner after alleging that her 2006 Civic Hybrid did not meet mileage claims advertised by the manufacturer. Honda won an appeal against this decision when a judge ruled that the vehicle’s fuel-economy ratings complied with U.S. Environmental Protection Agency's requirements, and that such ratings are for the purpose of comparison among vehicles. Consumers who purchased or leased a 2003 through 2009 Honda Civic Hybrid had until April 19, 2013 to claim a cash payment and Rebate Certificate from the class action lawsuit settlement. However, the Settlement Administrator has already begun to review claims and began mailing checks last month to those with validated claims. In March 2012 Honda Canada issued a release pledging to honor the USA class action settlement with owners and lessees in Canada when it was finalized in the USA. To date there has been no follow up to parties concerned, but shortly after the Honda release a class action was launched in Quebec courts on behalf of Quebec and Canadian owners and lessees. Honda announced that the Civic Hybrid was to be discontinued after the 2015 model year due to poor sales along with the Honda Accord Plug-in Hybrid, Honda Civic GX, and Acura ILX Hybrid. ^ "2003 Honda Civic Hybrid - Road Test". Archived from the original on 7 October 2011. ^ "2003-2005 Honda Civic Hybrid - Road Test & Review - Automobile Magazine". 1 May 2002. ^ "2003 Honda Civic Hybrid". Ars Technica. ^ "Green Autos In the Showroom, But Few on the Road". ^ "2004 Honda Civic Hybrid gets a Full Compliment of Interior and Exterior Enhancements". Honda Newsroom. Retrieved 22 July 2017. ^ "About EPA Fuel Economy Ratings". ^ "Car and Driver 2006 Honda Civic Hybrid - Road Test". CarandDriver. 1 January 2006. Archived from the original on 26 September 2011. ^ a b Hirsch, Jerry (10 May 2012). "Honda wins appeal in Civic hybrid mileage lawsuit" – via LA Times. ^ a b "DailyTech - Honda Civic Hybrids Encounter Battery Life Problems, Software Update Problematic for Some". ^ "2015 Subaru Outback and Legacy - Video Review - Consumer Reports". ^ Consumer Reports (7 March 2006). "Consumer Reports Revises Financial Analysis In Report on Ownership Costs for Hybrid Cars". Consumers Union. Archived from the original on 21 September 2007. Retrieved 2007-04-27. ^ "The dollars & sense of hybrid cars". ^ Vincentric. "Hybrid Comparison". Archived from the original on 4 February 2011. Retrieved 1 February 2011. ^ Sam Abuelsamid (16 August 2010). "Honda's fix for Civic hybrid batteries". Auto Blog. Retrieved 16 August 2010. ^ "Civic Hybrid Fast Gaining Acceptance". Honda Malaysia (Press release). 26 June 2009. Archived from the original on 4 October 2011. ^ "Honda begins sales of all-new Insight dedicated hybrid vehicle". Honda Motor Co. Worldwide site. ^ y Wayne Cunningham (11 September 2007). "Civic Hybrid completes 24-hour race". cnet Reviews. ^ Franca Davenport (21 October 2008). "Lotus accelerates hybrid rally car development". Daily Telegraph. ^ "Honda Sweeps 'North American Car and Truck of the Year' Awards 2006 Honda Civic and 2006 Honda Ridgeline Take the Top Honors" (Press release). Honda. 8 January 2006. Archived from the original on 21 February 2015. ^ "Motor Trend Announces 2006 Car Of The Year". Motor Trend. ^ "Honda Civic hybrid awarded the Best New Alternate Power Vehicle for 2006". GreenProgress. ^ "2006 Honda Civic Hybrid Wins 'World Car of the Year Award' for Greenest Car" (Press release). Honda. Archived from the original on 21 February 2015. ^ Sutton, Mike. "2012 Honda Civic Hybrid - Instrumented Test". Car and Driver (Nov 2011 issue). ^ a b c d e Ryan Gehm. "Fuel economy the focus for Honda Civic engineers". SAE International. ^ Christopher Jensen (23 September 2011). "Keeping Hybrid Weirdness at Bay". The New York Times. Retrieved 25 September 2011. ^ "New 2012 Honda Civic lineup boosts fuel economy in all models; Hybrid and HF offer 40+ mpg". Green Car Congress. 18 February 2011. ^ "Honda Civic Si Concept coupe and Civic Concept sedan debut at NAIAS; hybrid and natural gas variants". Green Car Congress. 12 January 2011. ^ "Honda Study Finds Insight's Eco Assist System Results in Average 10% Improvement in Fuel Economy After 300 Drives, Up to 20% Max". Green Car Congress. 12 February 2010. ^ "Honda to build Civic Hybrid in Indiana, will boost plant capacity by 25%". AutoNews. ^ a b "Honda Reaches 300,000 Units in Cumulative Global Sales of Hybrid Vehicles" (Press release). Honda Motor Co. 18 February 2009. Archived from the original on 24 March 2010. Retrieved 14 January 2010. ^ Hiroko Nakata (6 July 2008). "Toyota leads charge for new 'green' power source". Japan Times. Retrieved 22 July 2010. 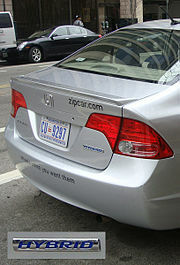 ^ Associated Press, "Woman wins small-claims suit over Honda Civic Hybrid", Yahoo! News, 2 February 2012; retrieved 2 February 2012. ^ Edvard Pettersson and Maurice Possley (9 May 2012). "Honda Wins Reversal of Small-Claims Loss Over Hybrid Mileage". Bloomberg. This page was last edited on 8 February 2019, at 17:33 (UTC).